Probably. Given how well the current classic look still "works," on every meaningful level, the only reason I can think to update would be commercial. I can understand the temptation from a business standpoint, but the effect from an aesthetic and emotional standpoint on a whole lot of long-time fans would be negative. A lot of us actually do care about that stuff. They'd be smart to weigh that carefully. I'll probably cross-post this at ES, but you made a good case so I thought I'd throw my two cents in here, too. You're right, the Skins have a classic look, and radically changing it would be as unsettling as the Packers or the Colts radically changing their uniforms. Many classic teams, however, have gone through one upgrade which I think has become almost universally recognized as a Good Idea, which is a color adjustment. Not a color change, just a color adjustment. This usually involves replacing obnoxiously bright colors that John Daly would wear on his pants with darker, smoother colors. The Eagles, Rams, Broncos, and Patriots have done this with very popular results. That doesn't mean the Skins would have to adopt a Flying Elvis logo or monochromatic uniforms, but darkening the colors to look more like the 70th anny combination (I wouldn't go quite THAT dark), or even Boston College/Florida State (again, strictly colors) would be a welcome change. No real disagreement here on a color tweak as opposed to a total redesign. It's just a matter of getting it "right." The obvious concern then being that getting it wrong would be, well ... like tofu or something. Totally agree. All this talk of changing our unis mystifies me. Why?! There is no damn need to change it! It's not like we're the Bills or something. I don't think the uniforms need a complete overhaul. But I do think they need to be "modernized" a bit. Keep the same look, but you have to update the look. We are running off a uniform that I want to say hasn't been changed since the mid-80's? Someone fact check that for me.. but it's been a long time. 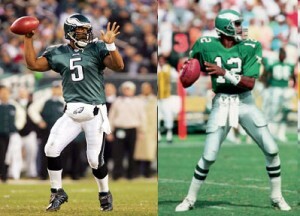 I think something like what the Eagles did would look good. They kept their same overall look but modernized the uni's for today's game. Just my 2 cents. I think when a team goes back to a previous look, it can be an ok thing. The Giants and Jets did it with success. While the current uni's have been around about 30 years now, Its ok to change something like the Pants to gold. I noticed you didn't post these pictures. 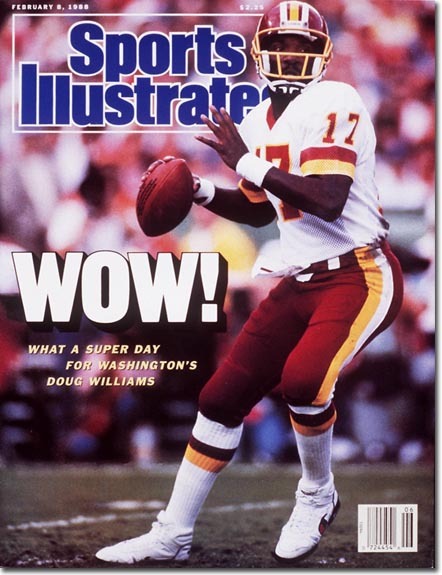 The Redskins are possibly introducing gold pants to the uniforms this year. A combination of gold pants along with the burgundy uniform would look great. 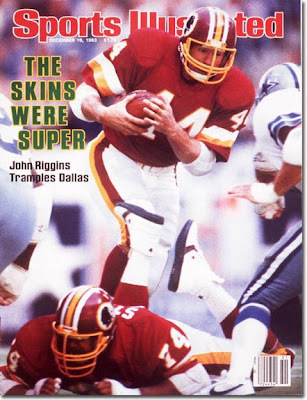 I in fact do hope the Skins change their uniforms, but only a subtle change. I would like the pants and jersey sleeve stripes to match what is on the helmet.... and of course gold pants instead of white.